Did Willie Ryan Make A Blunder That Cost Him The World Championship? In 1949, just a few months after I was born, Walter Hellman and William F. 'Willie' Ryan faced off in a match, the closing part of a three-way contest, which was to re-unify the checker world championship, then the subject of political dispute among several checker governing bodies. The match was to end in a 4-4-42 deadlock, with challenger Ryan failing to wrest the crown from champion Hellman. From all accounts it was a dramatic and exciting competition. 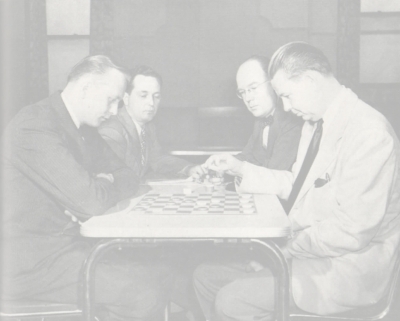 A book on this match, World Championship Checkers, was published in the following year, 1950, edited by noted player and problemist Tommie Wiswell, together with Willie Ryan. This is an excellent book, and well worth having if you find a copy on the used book market. The photos, biographies, and commentaries are entertaining and educational. Our topic here is the fifth game of this match, a game which may have been the critical one. It was a loss for Ryan, when he could have had a draw, and may likely have been the difference between a world crown and a vanished hope. In this game it is widely believed that Willie made a terrible blunder which cost him the game, a blunder that a player of his stature should never have made, a classic 'worst of the best' situation. That judgment has apparently stood for the past 55 years. I've lately been corresponding with skilled player and analyst Brian Hinkle. 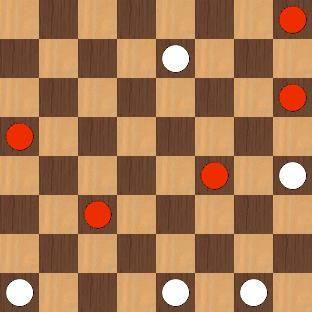 Brian and I exchange checker problems; he solves the ones I send, while I merely wish I could solve the ones he sends. 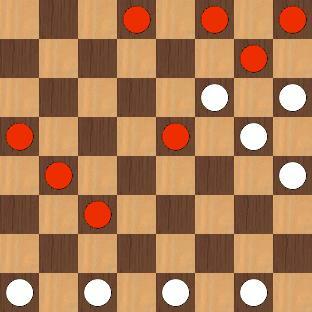 So, having come into possession of a new checker book, and having discovered game five of the match, I sent the critical position along to Brian. It arose from the following run-up from the 9-13, 23-18, 12-16 ballot. Within a few minutes, Brian of course came up with the best move to draw: 22-26, and then thought, again correctly, that Willie must have moved 15-19. Wiswell and Ryan, in the notes in the book, both considered this a terrible blunder, handing Hellman the game on a platter. 600.4s, D 37, 13-17,-44 4-8,-44 22-26,? 22-25,? 19-24,? 12-16,? 19-23,? In the post-game analysis and in the book, Wiswell, Ryan, and presumably Hellman and others never seemed to have discovered this. Willie had two drawing moves and played neither one! As this is a 10-piece position, and Chinook has a 10-piece ending database, Brian contacted Jonathan Schaeffer to find out what the 'exact' answer might be. The verdict came back: this is indeed a database draw. Through Brian's efforts, the analysis of the KingsRow engine, and the Chinook database, an important correction has been made to an historical game. Yes, Willie did make an error, and it probably cost him the crown, but it wasn't the one he or anyone else thought he made. I've reproduced the full game as played, and the notes from the book, below. A-An Edinburgh that was frequently played under the two-move style and, of course, favoring White somewhat. B-The premier attack of the opening and immediately puts Black on the defensive. C-This and 27-23 are popular lines. Against the latter the following has been played: 27-23, 10-17, 24-19, 8-12, 25-21, 1-6, 21-14, 13-17, 22-13, 6-9, 13-6, 2-27, 32-23, 7-10, 29-25, 11-15, etc. to a draw. D-Or 29-25, 9-18, 22-15, 11-18, 20-11, 8-15, 26-23, 2-6, 23-14, 4-8, etc. is another way of playing it. E-Ryan was undoubtedly expecting 32-28 which is frequently played. While the text may not be an improvement it is a very tricky line as subsequent play reveals. G-In view of the comparatively easy draw this allows, Hellman might have been expected to take the two-for-two via 24-19, 15-24, 32-38, 8-15, 28-10. However, Black still draws by: 4-8, 31-27, 17-21, 27-24, 8-11, 16-7, 2-11, 10-6, 11-15, 6-2, 15-18, 2-6, 18-23, 6-10, 22-26, etc. Fate was with Walter as Willie blundered and gave him the game on a silver platter---a most important game as matters developed. Continue from diagram: 22-26, 31-22 (or 30-23, 15-19) 17-26, 21-22, 15-19, 11-7, 19-26, 32-38, 3-10, 12-3, etc. Drawn. I-Of course. Black's doom is sealed. J-A lucky one for champion Hellman but he must be given credit for giving Black rope with which to hang himself. Sometimes that is half the road to victory. However Black must be credited with an error by his single 'assist' at Note H. H stand for Hellman---and also for the way one feels when losing a game like this. Ryan later stated: "When Hellman played 23-19 at E it became clear to me that he had something new on this formation. After Hellman played 19-16 and 16-11, White was threatening a number of winning shots. Each one of these shots had to be carefully examined in turn, in order to determine whether or not "the draw" hinged on allowing one of them. This process of elimination took up all of my time. I DID CONSIDER the pitch by 22-26, but only briefly. I thought that after 22-26, 30-23, 15-19, my Black piece on 17 was GONE, and that 11-7 would win!" Credits: analysis, Brian Hinkle and the computer engine KingsRow by Ed Gilbert; original commentary, Tommie Wiswell and Willie Ryan in World Championship Checkers; diagrams from the program CheckerBoard by Martin Fierz. Bob Newell, Santa Fe, New Mexico; last modified 03/30/05. This web page is optimized for viewing with the open-source Firefox browser.